With its arrestingly showy, mauvish blue to deep blue spring blooms, ease of cultivation and the largest flowers of all the peacock moraeas, Moraea gigandra is one of the most rewarding Cape irids to grow. Moraea gigandra is a winter-growing, summer-dormant geophyte (a plant that grows from subterranean buds produced on specialized storage organs). In the case of M. gigandra the storage organ is a well-developed corm that is annually replaced and consists of a short, solid, vertical stem surrounded by strong outer corm tunics. The mature plant grows up to 0.5 m high and produces a single long linear spreading basal leaf up to 0.9 m long. The large, iris-like flowers usually occur in shades of pale to deep mauvish blue or deep blue, rarely white or orange, and are borne at the tips of the minutely hairy main stem, and occasionally from a short side branch. The outer tepals of the flowers are attractively marked with a large black zone at the base, and above this a distinctive peacock-blue nectar guide occurs, outlined in white. The style has three conspicuous flat branches. The erect, oblong-shaped seed capsules split open from the top downwards, liberating large quantities of small, pale brown, angular seeds. This plant is listed as Endangered. 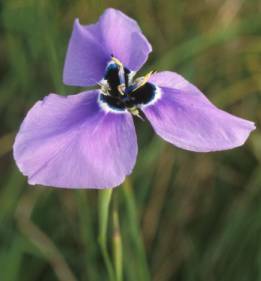 Moraea gigandra has an extremely limited distribution in renosterveld vegetation in an inland area of the Western Cape. It is on the verge of extinction here due to the ploughing up of its natural habitat for the planting purposes of winter cereal crops, and today survives in just a few, scattered remnant populations on low hill slopes and flats in moist, heavy, clay soil. The genus Moraea contains some 200 species and is widely distributed in sub-Saharan Africa, with outliers in the Mediterranean and the Middle East. 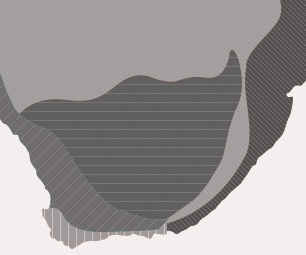 Its area of highest diversity is in the winter-rainfall zone of the Western Cape. The name Moraea was originally Morea, given by Philip Miller to honour Robert More of Shropshire, but Linnaeus altered it to Moraea. His wife's name was Sara Elizabeth Moraea and her father, Dr Johan Moraeus. The twisted anthers of Moraea gigandra are particularly large and long, hence the species name gigandra, which means large anthers in Latin. This species was only formally named and described as recently as 1927 by the well-known Cape botanist, Dr Louisa Bolus. The plant had, however, already been known of for many years in Europe during the eighteenth century. Moraea gigandra is probably pollinated by bees in its natural habitat. In the Kirstenbosch nursery it is regularly visited by bees that are attracted to the striking peacock-blue nectar guides near the base of the tepals. The corms of at least one Moraea species (M. fugax, formerly known as M. edulis) are known to have been eaten by the indigenous peoples of southern Africa, but those of M. gigandra are not known to have been consumed. 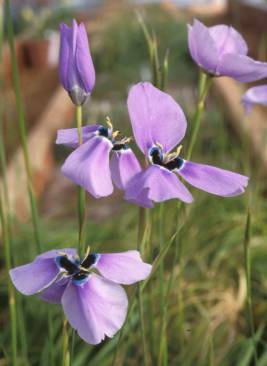 It is an attractive plant for containers and has been successfully grown at Kirstenbosch for many years. Seeds are regularly available to local members of the Botanical Society of South Africa, and it has also found a home in New Zealand, where it does especially well. 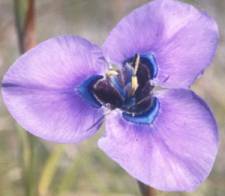 Although endangered in its natural habitat, cultivating Moraea gigandra presents no great difficulty. The corms are planted in autumn at a depth of about 3 cm in a freely draining medium such as equal parts of river sand and finely sifted, well-decomposed compost. 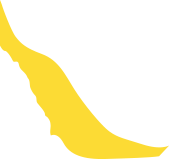 The plants like a very sunny aspect and are most successfully cultivated under cover in deep bulb beds or deep plastic containers with a diameter of 30 cm. In temperate climates they can also be grown in rock garden pockets that are securely lined with wire mesh to exclude moles. In cold climates of the northern hemisphere they are suited to cultivation in the cool greenhouse and must receive bright light for as much of the day as possible. Regular, heavy drenching of the growing medium is required during the winter-growing and spring-flowering periods, but the corms must be kept completely dry throughout the summer-dormant phase. This species is easily raised from fresh seeds (those harvested the previous season), sown in late autumn in deep seed trays, pots or directly into deep seed beds, in the same medium recommended for mature corms. Seeds should be sown at a depth of 3-4 mm and care should be taken not to sow too thickly, to prevent overcrowding and reduce the chances of loss to damping-off fungi. Germination takes place within six weeks and seedlings should be allowed to grow undisturbed for two seasons before planting them into permanent positions at the beginning of their third season, during which some may flower for the first time, if well grown. In the southern hemisphere, the flowering period extends from mid September to early October and the flowers only open fully on warm, still days, remaining partially closed in cloudy weather. Individual blooms are somewhat fleeting, each flower lasting only three days, but a succession of blooms are produced by the same plant over a two to three week period. The brilliant display created by a well-grown group of Moraea gigandra plants more than makes up for its rather brief flowering period. Moraea gigandra is not especially susceptible to pests and diseases although the undersides of the foliage do frequently fall prey to attack by red spider mites as temperatures rise in late spring. Fungal rotting of the corms frequently occurs when they have not been dried out sufficiently during the summer months. Duncan, G.D. 2002. Just holding on — spectacular geophytes in peril. Veld & Flora 88: 142-147.